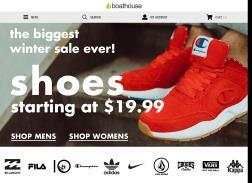 Boat House is the online home for fashion apparel and shoes for men and women. Featuring items like jack woven shirt, scotty woven shirt, henry woven shirt, billabong amplified jean, billabong mcfeely jean and more. Up to $30 Off on Sale Items. Save 20% on all retail styles. Get Up to 50% Off select Shoes. Get Up to 23% Off Select Guys Boots + Free Shipping on $75+. 10% Off Online Orders. Limited time only. Get up to 80% off Clearance.